Costumes of Rome. Eminent woman 1840. Home » Costumes of Rome. Eminent woman 1840. From the book: Nuova Raccolta dei principali Costumi di Roma e suoi Contorni Roma Presso l’Editore e Calcografo Tommas Cuccioni Negoziante di Stampe ed Oggetti di Belle Arte Via della Croce N. 88. Rome, 1840-50. Engraved by Salvatore Marroni. 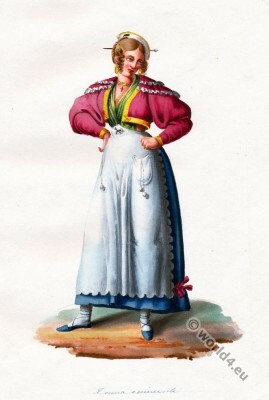 This entry was posted in 1840, 19th Century, Italy and tagged Traditional Italy national costumes on 3/3/15 by world4.